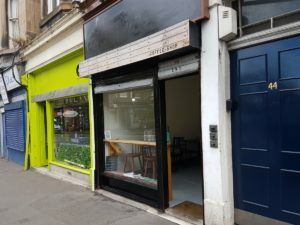 I was sad to see Tiramisu, on Easter Road, close down, but it has been a cafe space that has seen many businesses cycle through it over the course of the last few years. In its place comes a new cafe called Little Fitzroy, under the stewardship of barista legend Cathryn Cripps Clark. I’ve long been a fan of Cathryn’s work, from her time at Hula to stints at Machina, Baba Budan and others. This is her first solo venture and I visited in its first few days of operation. For now the focus is coffee and cakes, but there’s a full kitchen available so brunchy type offerings have already started to emerge and will become a permanent feature once things have bedded in. I stuck to my usual pattern and ordered an espresso (£2). I took a seat and was soon saying hi to an enthusiastic canine visitor. The coffee was a gatare, roasted by Machina. It opened with bright fruit before resolving to a chocolatey finish. It was outstandingly good stuff. 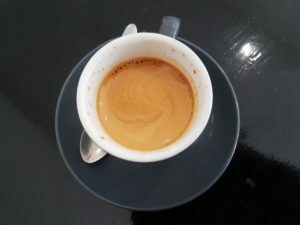 So overall, Little Fitzroy has hit the ground running with exceptionally good coffee, tempting looking baked goods, and the promise of further treats to come. Make sure to visit soon and visit often.